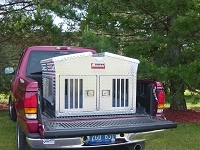 This Hunter Series Double Kennel Dog Box is ideal for the hunter needing to travel with two dogs. 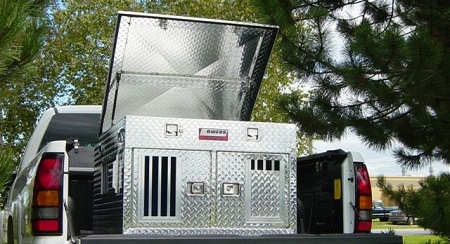 Not only can you transport your dogs right into the field with you, but the convenient built-in top storage compartment can be used for storing all of your hunting and training supplies as well. Additional features include a rugged diamond tread aluminum construction with large dual dog compartments lined with plastic corrugate, full length top storage compartment for guns, electronics and hunting gear. Top storage is easy to close with the Owens Pull Strap. Lockable slam latch doors with storm covers are slotted for crate cooling fans. Vented with standard side (7 x 10) vents for air flow with storm covers. Center divider has air holes for cross ventilation between the compartments. Spring loaded rattle-free carrying handles. Two D-rings that can be utilized to strap down in your vehicle. ** Don't forget to add any accessories you might want for your dog box, such as rain awnings, storage trays, cooling fans, rubber mats and more! Many of these accessories are only sold with a dog box and are not sold separately. Just click the checkbox next to each of the accessories you want to add within the Optional Add-ons section above. The cost of the accessory will be included in your dog box price automatically. By adding your accessories now, you won't pay any extra shipping and we'll even give you a discount off our normal retail price of these same items found elsewhere in our store.